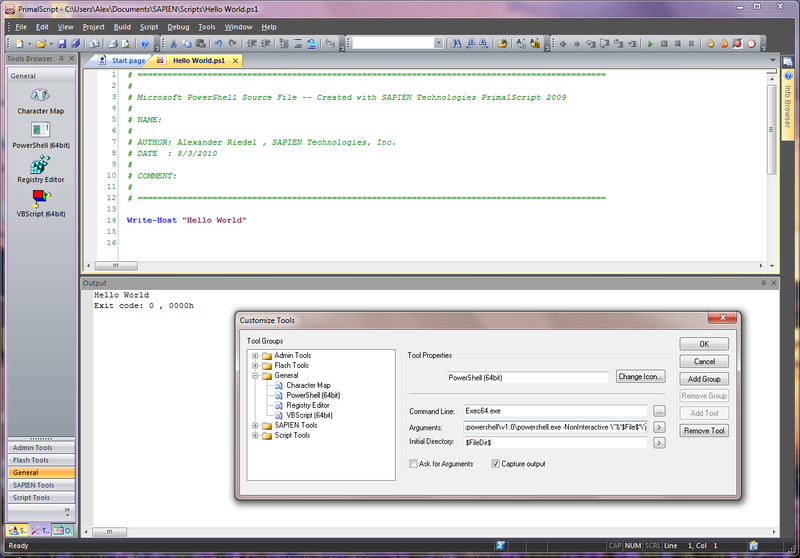 Last time we looked at running VBScript files in 64 bit from within PrimalScript 2009. As you may recall, the only thing required was to provide a path to the 64 bit CScript.exe or WScript.exe and substituting “sysnative” for “system32”. The rest was all automatic. As I mentioned last time, PowerShell requires some extra work. PrimalScript redirects stdin, stdout and stderr when capturing the output of a process and PowerShell.exe does not react well to that. This has been a PowerShell problem since V1 and wasn’t fixed with V2. Basically the PowerShell process will just hang and do nothing when you redirect stdin. I am assuming that if PowerShell sees a redirected stdin stream it just awaits commands from there and ignores anything else. 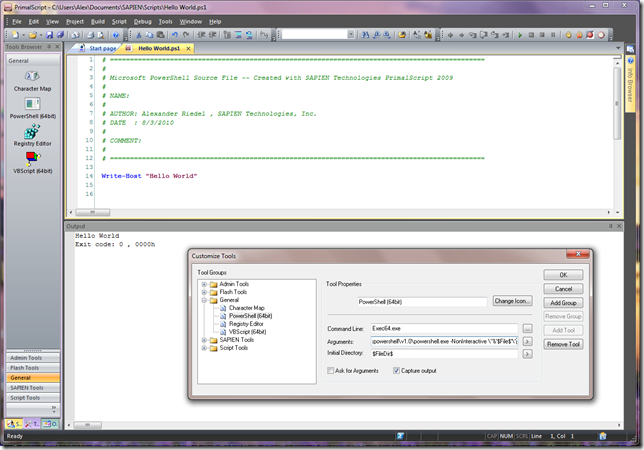 Download and extract the executable to your PrimalScript 2009 installation folder. Right click anywhere in the tools browser and select “Customize…” and add a new tool in a group of your choice. In order to run the current script in 64 bit mode you only have to click on the icon.